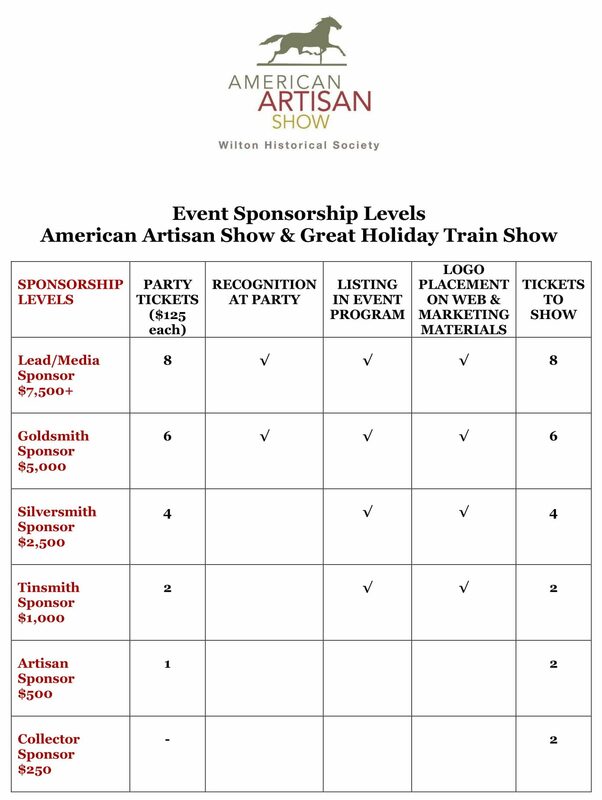 If you are interested in becoming a sponsor for the 2018 American Artisan Show, we encourage you to get in touch with us either over the phone at (203) 762-7257 or email us at communications@wiltonhistorical.org for more information. Each Lead and/or Media Sponsor will be featured prominently on the Society’s website, publication and public relations materials, and receive eight complimentary tickets* for the Preview Party on Thursday, November 1st, as well as eight admissions for the Show. Lead Sponsors will receive a personal introduction and recognition at the Preview Party, and prominent signage acknowledging support. Each Goldsmith Sponsor will help us underwrite the costs associated with the tent rental for the American Artisan Show. Each Goldsmith Sponsor will receive six complimentary tickets* to the Preview Party as well as six admissions for the Show. Sponsor logos will be featured on the Society’s website, and publication and public relations materials. Each Silversmith Sponsor will help us underwrite the cost of marketing and printing. Each Silversmith Sponsor will receive four complimentary tickets* to the Preview Party as well as four admissions for the Show, and be listed on the website, and publication and public relations materials. Each Tinsmith Sponsor will support the special artisan exhibitions Preview Party on November 1st. Collector Sponsors will receive two complimentary tickets* to the Preview Party as well as two admissions for the Show, and be listed on the website and program guide. Be one of the Society’s Artisan Sponsors for $500.00, and become a valued member! You will be acknowledged on event publications, and be a vital part of the Society’s fall fundraising events. You will receive 1 complimentary ticket to the Preview Party and 2 complimentary admissions American Artisan Show on Friday and Saturday. Be one of the Society’s Sponsors for $250.00 each, and become a valued member! You will be acknowledged on event publications, and be a vital part of the Society’s American Artisan Show. In addition, you will receive two complimentary admissions to the Friday-Saturday show. *Value of each preview ticket is $125.00. Click here to print our a Sponsorship form (PDF) to fill in and mail with your check.